In about four months, the prestigious underground house and techno festival located in the extremely beautiful Twiske just north of Amsterdam opens its doors again. 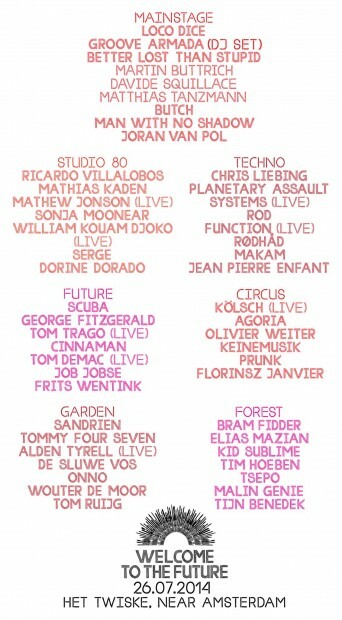 That’s right, the eighth edition of Welcome to the Future festival will take place on Saturday, July 26th. Spread out over 7 different stages, 47 of the world’s leading acts and artists will be celebrating all spectra of underground electronic music. Welcome to the Future started as an indoor event at club Paradiso over 20 years ago and has organically evolved to one of the most credible house and techno festivals the Netherlands has to offer. Last year’s edition was a huge succes featuring artists like Solomun, Maceo Plex, Dubfire, Joris Voorn, Ellen Allien, Kevin Saunderson, Karotte and KiNK amongst others. The festival stands for intimacy, a forward thinking musical vision, great sound and a big green heart. And, in all honesty, they took their musical journey to the next level this year. To get an idea of the musical armour this festival will be carrying, we hand-picked a few notable artists to put in the spotlight for you. In case you’ve been living under a rock, Ricardo Villalobos is a Chilean-German electronic music producer and DJ. He is well known for his work in the minimal techno and microhouse genres, and is one of the most significant figures in today’s minimalistic techno scene. If you don’t know him for his music, you’ve surely heard stories about him –quite literally— getting lost in his music. He is undoubtedly the rock ‘n’ roll icon of the dance industry. Whether you like him or not, you’re always in for a serious ride. ROD is the newborn alter-ego of Rotterdam based Benny Rodrigues, currently one of the most popular and inspiring electronic music artists of the Netherlands. Known for his versatility, Benny has chosen this additional artist name to clearly define the more techno-oriented side of his musical identity. With his vast knowledge of music, his undying love for techno and his sharp taste, ROD is firmly placing himself in the top tier of the new school generation of techno artists. Definitely one of Holland’s most promising talents. Job Jobse is only 24 years young, born and raised in Amsterdam, and understands our capital’s nightlife like no other. After his residency for Trouw and his involvement with the Life & Death crew, Jobse has made huge leaps forward in his musical career over the past year. He’ll probably end up playing at every Dutch festival this summer, and beyond. He deserves it, we’ll be hearing a lot more from this DJ.